NBA X's & O's maven Sebastian Pruiti (formerly of NBA Playbook, now at Grantland) watches a lot of basketball on television—as much, I'd wager, as anyone in the country. An experienced observer of local NBA broadcasts, then, he's within his rights to offer the tame criticism of the Mavericks broadcast team of Mark Followill and (former Dallas player) Derek Harper you see above, a reaction to last night's Thunder-Mavs game rebroadcast on NBA TV. 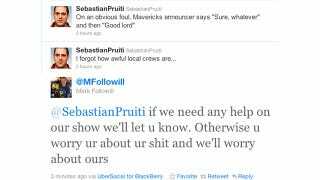 Note that Pruiti didn't tag Followill's Twitter account or even mention him by name. (The criticism, by the way, is legit; Followill & Harper whine and complain about every foul called on the Mavs. Harper's an especially bad replacement for Brad Davis, who'd previously sat in the #2 TV seat.) Followill's response is childish and stupid, partially because he types like a txt-speaking teenager. One of Mark Cuban's maxims is "You don't own your business, your customers do." It seems he could do a better job reminding his employees of this. Update (5:15 p.m. ET): I talked to Mavs third man Jeff Wade, who says Followill's tweet was in response to this exchange between Wade and Pruiti. That makes Followill's tweet less strangely out-of-the-blue, as it appears to be more of a defense of Jeff Wade (it may have also been in jest, though he was certainly mistaken if he thought Pruiti or anyone else would take it that way). Wade also wanted to make it clear that the on-air statement Pruiti is criticizing in the tweet came from him, not from Followill or Harper.